Well even though I am a confirmed night owl, and I maintain excellent health compared to anyone else my age at every age bracket ... I keep hearing about how bad it is for my health to live as I do. Well, people want to also suggest that I SHOULD get entrained back to a NORMAL Circadian Rhythm ... well egg heads will beat that drum for as long as they insist, yet I will maintain my own sense of wake sleep rhythm, regardless. I have always listened to my body, and quite frankly my body HATES being up during the day. I am flip flopped from the 9 to 5. When people start going to work, I go to sleep. It has had some strategic disadvantages in the job / career market, yet I've adapted to only EVER taking night jobs. I excell at night and my brain is at it's best at midnight. I think many artists, philosophers, Inventors, musicians and writers do their best work at night. I can not get in the mood for anything in the daytime ... please close the curtains. NEVERTHELESS, the authorities keep insisting (as they previously and erroniously did about coffee, ulcers and eating carbs) that I'm wrong in choosing my own sleep wake rhythm .... so I ignore the "evidence" ... when I know I'm right, I stubbornly stick to what I know to be true for me. But anyway for all you 9 -5 bwho are addicted to athority stats ... well here's a plethora to keep you amused and concerned. Personally, I'd say get a float tank and then sleep as you will .... the tank can not only reset your circadian rhythm but also withdraw your need to sleep at all .... as I proved to myself in the 80's when I owned a tank and did not sleep EVER for three months. Researchers have identified a protein that is involved in the body’s internal 24-hour clock, known as the circadian rhythm. The protein, however, appears to get disrupted in shift workers and those experiencing jet lag. The biological clock oscillates over 24 hours and is affected by factors such as temperature, food, sunlight or artificial indoor lighting. The clock's mechanism, or what scientists call the suprachiasmatic nucleus (SCN), is located in the hypothalamus of the brain, above the point where the optic nerves cross. Armed with information about surrounding light, the SCN signals the pineal gland in the center of the brain to secrete hormones that regulate bodily functions. One of these hormones, melatonin, is released when it is dark and causes drowsiness. The role the circadian clock plays in disease and genetics is slowly being unravelled and understood. Some of the latest findings show that women who do shift-work have an increased risk of menstrual disruption and subfertility; that the body clock has an intrinsic power to help fight intestinal bacterial infections; and that severe depression could be linked with altered genes that control the circadian clock. "Important metabolic functions are heavily influenced by circadian clocks, which is why activities such as chronic night-shift work, which can cause a misalignment of this clock, increase one's risk for metabolic and autoimmune diseases such as obesity, Type 2 diabetes, cancer and multiple sclerosis," says Dr Katerina Akassoglou, a neurology professor at the University of California San Francisco. Akassoglou's team recently discovered a protein, p75NTR. Present in liver and fat cells, it regulates blood glucose levels, an important metabolic function. A drop in its level affects the timing of other circadian genes in the brain and the liver, as well as genes that regulate glucose and lipid metabolism. The production of this is controlled by two master genes that direct the body clock. "Just about everything that takes place physiologically is really staged along the circadian cycle," says Leonard Guarente, a professor of biology at the Massachusetts Institute of Technology. "What's now emerging is the idea that maintaining the circadian cycle is quite important in health maintenance, and if it gets broken, there's a penalty to be paid in health and perhaps in ageing." Guarente's team reported recently that a gene called SIRT1, previously shown to protect against ageing diseases, plays a key role in controlling circadian rhythms. The researchers found circadian function decays with ageing in normal mice, and that boosting SIRT1 levels in the brain could prevent this decay, presenting possibilities in developing treatments for ageing diseases. A recent paper indicates that cyclic exposure to light and dark causes fruits and vegetables to regulate their cellular metabolism such that the amounts of certain compounds are increased, some of which are beneficial. The paper's researchers, based at Rice University and the University of California at Davis, have published previously on the phenomenon of "entrainment" in plants. Entrainment refers to the programming of an organism's circadian rhythms into certain routines. The group had examined how exposure to light influences the ability of Arabidopsis, a plant in the cabbage family, to ward off insect damage. They found that the plant ramps up its levels of natural insecticide chemicals shortly before dawn, when insects begin feeding. In a controlled experiment, the researchers were able to use light/dark cycles to dramatically slow the rate at which caterpillars devoured a leaf. One category of insect-discouraging chemical, glucosinolates, is known for anti-cancer properties in humans, and there might be others, says Dr. Janet Braam of Rice University, the team's leader. "We have found that two plant hormones that are critical for plant defense are controlled by the circadian clock, that is, their levels vary depending upon time of day. We hypothesize that these hormones regulate the levels of metabolites important for defense," Braam explains via email. Her team's new paper, published this June in Current Biology, examined the effect of simulated day and night cycles on the internal clocks of blueberries, spinach, lettuce, carrots and squash. All of these exhibited entrainment in response to light. "It is surprising that carrots responded to the light/dark cycles because they are typically underground and not, therefore, exposed to light," Braam says. "However, the carrot cells retain structures that are related to chloroplasts [plant cellular structures where photosynthesis takes place] and perhaps in response to light these structures remain light responsive." This research could have implications not only for how food is stored, but how it's prepared, and when. Dr. Pierpaoli is one of the foremost anti-aging researchers in the world, especially with regard to melatonin and other neuropeptides. His research findings have had profound implications and contributions in the development of the Neuroendocrine Theory of Aging, indeed he was a personal friend of the late Vladimir Dilman. Dr. Pierpaoli's findings regarding the use of Melatonin indicate that apart from helping to modulate circadian rhythms and improve sleep, that melatonin protects the pineal gland. Dr. Pierpaoli believes that the control of these rhythms and the protection of the pineal is of critical importance in anti-aging and indeed rejuvenation therapy. He has published this information, in the best seller: The Melatonin Miracle. Dr. Pierpaoli is also an award holder for Excellence in Anti-Aging Medicine from the Monte Carlo Antiaging Conference ™. Melatonin’s effect on longevity is well documented; in fact laboratory tests on rats and mice have demonstrated that melatonin increased their lifespans by 20%. Experts believe melatonin is a vital anti aging product because of its positive effect on the aging immune system, its protection of the cardiovascular system, its ability to increase growth hormone production and above all its capacity to limit free radical damage. Sleep is crucial to our health and well-being; we need it as much as we need oxygen. It allows our bodies to rest and refuel and gives the body’s cells a chance to repair and regenerate. The average adult needs between 8 and 9 hours of sleep per night to allow for the completion of this regeneration process. But most adults get less than 7! Study upon study continues to show that people who don’t get adequate sleep are at increased risk for a myriad of health problems and illnesses including obesity, diabetes, immune-system dysfunction, as well as impaired job performance, concentration and productivity in many other activities. The sleep cycle stems form an interaction between how much sleep you get (hours) and the circadian cycle -the 24 hour sleep/wake cycle of light and darkness created by the rotation of the earth. The pineal gland, a pea-sized structure at the center of the brain, works with the hypothalamus gland to control your sleep/wake cycles. At night, in darkness, the pineal gland produces melatonin, which causes your heart rate to slow down and your body temperature to drop- physiological conditions that allow for deep, restful sleep. 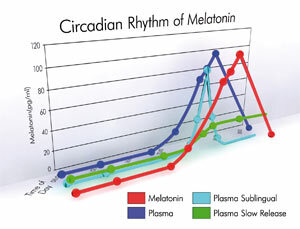 As we age, the amount of melatonin produced by our body lessens, re-sulting in the sleep disturbances. Numerous scientific studies have shown that taking synthetic melatonin as a supplement can help correct the irregularities in the body’s circadian cycle that prevent a good night’s sleep. Melatonin supplements have worked wonders in the treatment of insomnia, sleep disturbances, jet lag and seasonal affective disorder. But sleep isn’t melatonin’s only story. In extensive clinical trials, I (Walter Pierpaoli) have discovered that the benefits of taking synthetic melatonin supplements reach far beyond a good night’s sleep. So far, in fact, you might call it “The Miracle Molecule”.